Put the flour and salt in a food processor and pulse until well incorporated. Add the butter and pulse until butter is in small bits the size of peas. Drizzle in ice water while food processor is running. Stop when the dough looks moist enough to hold together. Wrap in plastic and refrigerate for 30 minutes. Preheat the oven to 375F (190C). Roll out the dough and fit it into a 9-inch tart shell. Blind bake it by lining the tart with greased aluminum foil and pie weights. Bake for 40 minutes. Remove from oven and allow to cool, about 15 minutes. Mix the chèvre and pesto together. Season and spread it on the bottom of the tart. 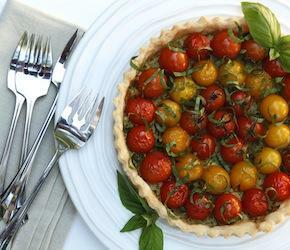 Fit a circle of cherry tomatoes around the outside of the tart. Continue to fill the tart with cherry tomatoes, alternating colours if possible, until the entire tart is filled with cherry tomatoes. Bake for an additional 25 minutes or until filling bubbles. Remove from oven and allow to cool. Garnish with fresh shredded basil.